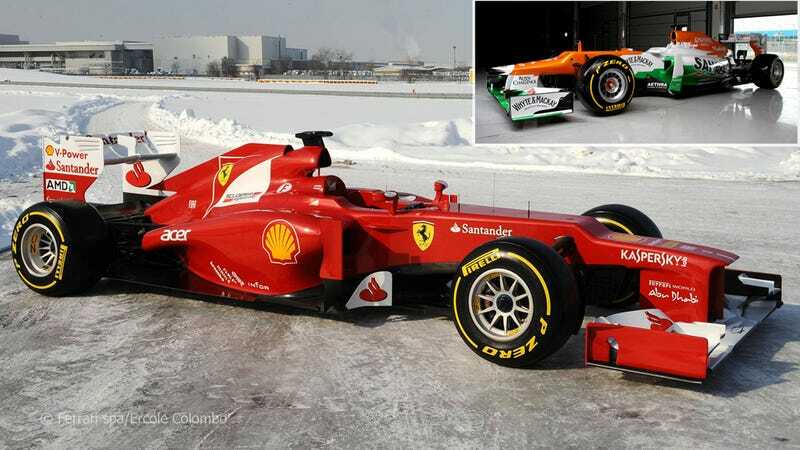 Caving to the wave of backlash over its now-aborted five-seater prototype, Ferrari has hastily redesigned its F1 car overnight, resulting in this ugly little duckling, the F2012. Force India unveiled its own duck-billed racecar as well. Click through for in-depth details on these machines. According to Ferrari, "The car is due to undergo a very intensive development programme over the first part of the season, especially on the aerodynamic front." Jalopnik's sources within Ferrari, who may or may not be figments of my imagination, believe this process will involve a lumberjack attacking the car with an axe. We expect this to be a highly successful effort to improve the car's front end aesthetics. Force India also unveiled its new Mercedes-powered car, the VJM05. According to Jalopnik's unnamed source, who is definitely not a house plant, Force India's designers "looked to organic forms for aerodynamic inspiration. They chose the surprisingly fluid-dynamic platypus, and the whole Force India team took a four-month retreat to eastern Australia to collect data on these reclusive beasts." We are going to say that we love both of these designs and cherish them as masterpieces, in the hopes that one of these teams reads this and gives us pit passes to the upcoming US Grand Prix in Austin, TX.